Welcome to the ESA SMOS Online Dissemination Service. For troubleshooting or questions, please contact smos.dissemination.support@esa.int. The following Web Browsers are supported by this system: Internet Explorer, Firefox, Google Chrome, Safari. It is recommended that a recent version is used. The available free and open data are organised into different collections. Files in the native Earth Explorer (EE) Ground Segment File Format Standard have the extension ".zip", while those in NetCDF format have the extension ".nc". 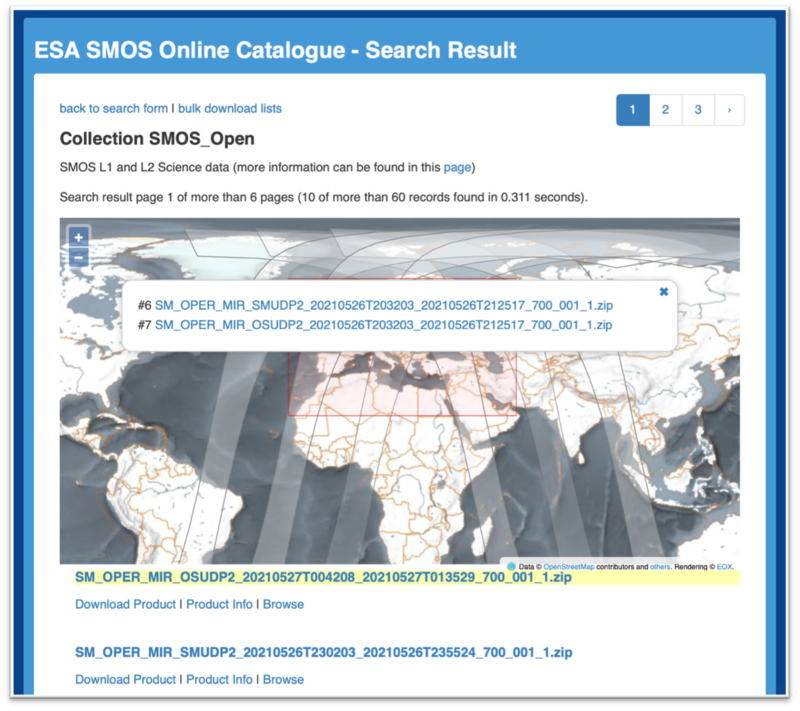 A description of the individual SMOS data products and the relevant Product Format Specifications can be found on the ESA Earth Online website. Data readers and a description of the structure of the NetCDF files are also available. MIR_SC_F1B/MIR_SC_D1B: Level 1B product, FULL/DUAL polarisation mode, in EE format. All data coming from the operational pipeline in the SMOS Data Processing Ground Segment has the File Class set to "OPER", while any reprocessed data is tagged as "REPR". Restricted data: please note that restricted L0/L1A and L2 OS/SM Data Analysis Products, along with all the Auxiliary Data Files, are only available to CalVal users, and via FTP only. Should you need to access any restricted data, please send a request to the SMOS Mission Manager for authorisation. AUX_ECMWF_: ECMWF data on the ISEA 4-9 DGG corresponding to SMOS half-orbit, in EE format. MIR_SMNRT2: NRT L2 Soil Moisture estimates from Neural Network, in NetCDF format, disseminated within 4 hours from sensing. MIR_SIT_3C: SMOS L3 Sea Ice Thickness product, in NetCDF format, available with a latency of 24 hours. In order to provide a unique username and password for all EO services available on the web, ESA introduced the Earth Observation Users Single Sign On service (EO-SSO). You can openly search for and browse the available data products, but log-in with an EO-SSO account is required in order to download files. Those users not having an EO-SSO account can follow the instructions for creating one beforehand. See also the EO-SSO FAQ page. The SMOS Online Dissemination Service provides two different mechanisms for searching data, one based on HTTP via the dedicated web portal and another one based on FTP. Below the details on how to use the two methods. To start searching for data, navigate to http://smos-diss.eo.esa.int, click on the "Search" button and choose a collection. Three product search mechanisms are provided and listed. This function allows navigating a dynamic structure via the Web Browser where data is organised in collections. The user can navigate among the available data types by Processing Level, Product Type, Year, Month and Day (of the sensing or validity date). This function allows searching a product by its file name. You can use the whole name of the file of interest, or part of it (using "*" for any number of characters and "?" for exactly one character of any type) in order to search for multiple products. To display the results in a list of products, tick the "Show search result as product list". To display the results in a short URL list, tick "Show search result as URL list". Note that in case of more than 500 results the view defaults to a "URL list". This function allows searching for data using different parameters and obtaining different results. "Format": "HTML search response" is intended for detailed browsing, "Bulk download lists" and "Plain text metadata index" is intended for bulk download. "Items per page": it only refers to the "HTML search response"
"orbitDirection": it can be used to select the orbit direction by optionally chosing one of the possible values from the drop-down menu, i.e. "ASCENDING" or "DESCENDING"
"productType": it allows selecting the product of interest by chosing one of the possible values from the drop-down menu. The search results can be adjusted as described in Section 2.1.3.2.
an HTML page with the list of all requested products. "Plain text metadata index": it returns a plain text page containing the full metadata records for the matched products, encoded in a tab separated value format. It is also possible to set the pagination parameter ("Items per page") to define the maximum number of records per page of the "HTML search response". The "HTML search response" (see Section 2.1.3.2) contains a list of data items (products or auxiliary files) matching the search parameters, organised into different pages each with as many items as indicated in "Items per page". The displayed list of results contains the data item file name with a link to download it (it requires authentication), a link to view the associated metadata and, for L1C and L2 products, a link to the relevant browse image. In order to identify a given item on the map, by clicking on its file name, the item will be highlighted in the map, zoomed to its extent. On the other hand, by clicking on a given product footprint displayed on the map, the corresponding search record in the list will be highlighted. This function allows navigating a dynamic structure via a standard FTP Client (FileZilla, CyberDuck, etc.). Data is organised into different collections the user can navigate by Processing Level, Product Type, Year, Month and Day (of the sensing or validity date). The L2 Soil Moisture and Ocean Salinity user products available in NetCDF format can be found under the [Product_Type]_nc subdirectories. You can refer to Section 3.2 for additional details on the FTP access. There are different mechanisms to access the data and download the products of interest. Download the files by using the product download links. The SMOS directory tree will be displayed. In case of problems with FTPS (FTP encrypted with SSL/TLS), please try with "plain FTP". For UNIX and UNIX-like systems it is recommended to use the LFTP command-line client. Note to CalVal users: restricted L0, L1A, L2 OS/SM DAP and all static and dynamic Auxiliary Data are only accessible via FTP. Select "Start" for immediate download, or "Add paused" and activate the download at wish from the "DownThemAll! Manager" window. The catalogue can be queried via a command-line tool like cURL, saving the output as a URL list file. A tool supporting SSO authentication schemas (such e.g. secp, a generic utility written in Bash to access EO data from multiple repositories) must then be used to perform URL downloads to a target directory. To fetch a plain text url list from the catalogue and store it in a temp_file. To download all products, without compression, using the SSO credentials (requested the first time and then stored locally for further accesses) one at a time to the local directory. In case of problems with the authentication process (inconsistent session), you can try to solve the issue by cleaning the cookie cache (Browser memory) or by closing and reopening again your Web Browser.